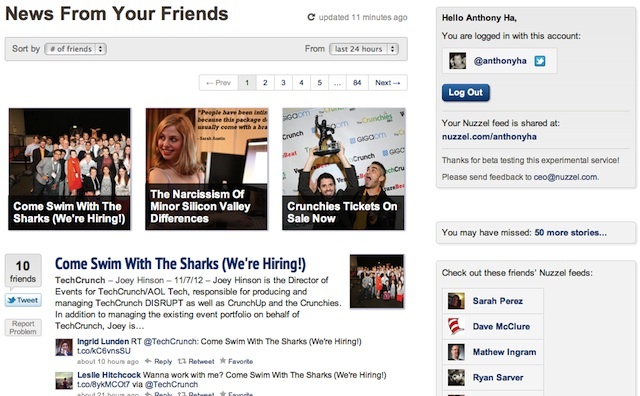 Social news startup Nuzzel has raised more than $1.7 million in seed funding. I say “startup,” but at this point the only person working full-time on the project is Jonathan Abrams, who previously founded or co-founded Friendster, HotLinks, Socializr, and the Founders Den. With the new funding, Abrams is ready to start hiring — you can browse the list of available positions here. As a Nuzzel user, the one that I’m most excited to see is “iOS engineer,” which confirms that Abrams plans to launch iPhone and iPad apps. There are lots of other social news apps out there, and they often highlight their sophisticated technology for determining topics, interests, and so on. Abrams took a different approach with Nuzzel, trying to make it as fast, simple, and clean as possible. At its heart, Nuzzel is just a stream of links that the people you’re following on Twitter and Facebook have shared the most, viewable on the Nuzzel website or via email digest. (You can also explore content shared beyond your immediate social network on a page with links from friends of friends, and look at the social feeds of other users.) It almost sounds too simple, but in the months since Nuzzel’s launch, I’ve found that it’s a reliable pointer to interesting content, without requiring any real set-up on my part. Because I follow a lot of TechCrunch writers and readers, it’s often dominated by stories from TC, but hey, I don’t mind — it’s actually a good way to keep up with TC stories that I might have missed, as well as those from our competitors. And, y’know, non-tech news too.